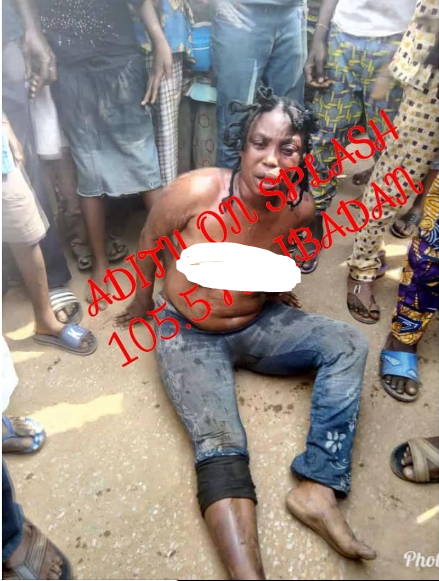 A suspected female kidnapper was given the beating of her life after she was apprehended while allegedly trying to abduct three children in Ibadan, Oyo state. It was gathered that the suspect identified as Tawa, met the children on the street at Mokola area of Ibadan, the state capital, when she attempted to kidnap them. According to an eyewitness, the woman touched the children with a charm and they lost control. She was about taking them out of the vicinity after the hypnosis, not knowing a petty trader by the roadside saw her and what transpired. The trader approached her and asked her what she was doing with the children, but she couldn’t give an answer. According to Abiodun Adewole of Splash FM, an alarm was immediately raised as neighbours and residents including the children’s parents trooped out and descended on the suspected kidnapper. She was stripped and beaten mercilessly before she was handed over to the police.